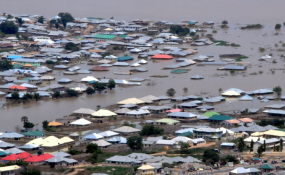 Katsina — The death toll from the flood that ravaged 10 villages in Jibia Local Government Area of Katsina State on Sunday has risen to 58 as more corpses were said to have been discovered Tuesday from demolished structures and water channels within the affected communities. He said: "We buried more than 27 bodies and more are being uncovered from collapsed structures. My officers in collaboration with villagers are on search and rescue mission to uncover the bodies of the victims. "We have resettled some people at make shift camps in schools and government is supplying food items and medicals to the affected persons who survived the ungodly incident." Meanwhile, the federal government has said it would compensate the victims of the natural disaster, which has rendered thousands homeless. Vice-President Yemi Osinbajo stated this Tuesday evening during a visit to Jibia to commiserate with those affected by the natural disaster. He said efforts would be made to ensure that adequate relief materials reached all the victims. According to him, "The president has asked me to assure you that everything will be done to ensure that everybody is taken care of, and that we will make sure this sort of thing does not repeat itself again. "As Nigerians, we all deserve to live our lives happily, we deserve to be treated well, and the president has assured everybody that working with the state government, we will do all that is necessary. "Where compensation is necessary, we will compensate, where rebuilding is necessary, we will do so." The National Emergency Management Authority (NEMA) and SEMA are working round the clock to provide the displaced persons with relief materials that include food items, mattresses and medication. Osinbajo was accompanied by the state Governor, Alhaji Bello Masari; the Director General of NEMA, Mr. Mustapha Maihajia; and his SEMA counterpart, Waziri.